In 1867, a guy named Joe Baldwin died from a horrible train accident in Maco, North Carolina . Some people believe that he was the conductor of that train and some people believe that Joe worked on that train track. At the time Joe was riding in the last train cart. Joe’s train cart started to slow down. Eventually, his train cart was detached from the rest of the train. Joe then realized that another train would be coming any minute. Then, he heard it. This time it was different, this train was a passenger train. He decided that he had to find a way to warn the other engineer that his train cart was in the way of the tracks so that the passengers would not get hurt. Joe stood on top of the train and waved a lantern back and forth to try and warn the engineer. He did not know if this was going to work or not , but he had to try and do something to try and save the passengers on the other train. The engineer of the other train saw the light and tried his best to stop before he hit Joe , but there was no possible way he could stop in such a short distance. Joe died and was decapitated. During the time of the accident investigators looked and looked for Joe’s head, but they unfortunately had no luck. To this day they still have not been able to find Joe Baldwin’s head and he was buried without it. 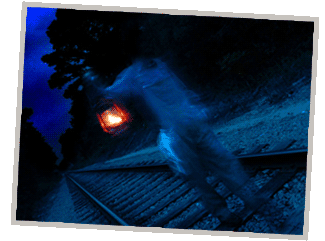 Years after people reported that a lantern would start coming near you and then gradually float away when they visited where the tracks in Maco, North Carolina used to be. Today, people are still traveling to the tracks to see if they can see The Maco Light. The legend still goes on, but some people are not sure that the light is what everyone thinks it is. This link gives a lot of information on The Maco Light as well as photographs of the train. This short article explains the history of The Maco light. This video shows the town of Maco, North Carolina and the legend behind it with a ghost hunter.